Edith Yeung is a partner at 500 Mobile Collective. China is the largest smartphone market in the world. It’s no surprise, then, that Uber has committed more than $1.2 billion in this coming year to winning the market. After just 12 short months, Uber has gone from one percent to somewhere between 11 and 30 percent market share (stats seem to vary widely), with plans to expand to 100 new Chinese cities this coming year. I’ve been traveling back and forth between the U.S. and China since 2011. I’ve learned a lot from my friends and colleagues about the differences between the two markets — especially in the mobile space. Trust me, it’s complicated — but the fundamentals are similar. 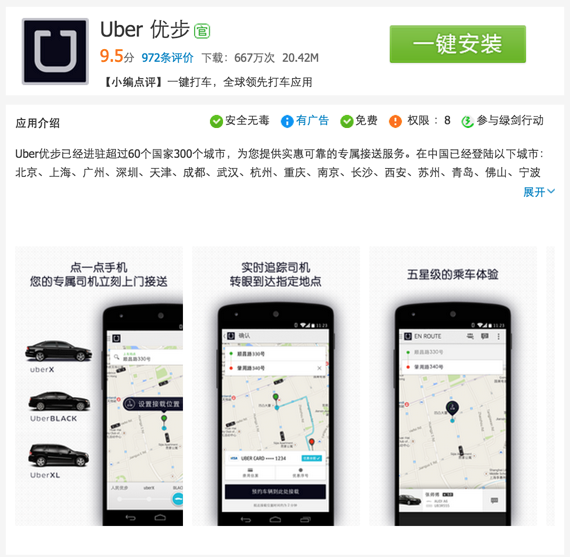 I wanted to share five practical tips that most mobile-focused companies neglect to do when entering China, but that I think Uber has done exceptionally well. This is a super basic, but important point that so many companies fail to do. Chinese people will not search for any app in English. Picking an appropriate Chinese name is very important for your launch in China. This might sound rudimentary, but many — too many — mobile app companies do not localize in this simple way. There isn’t a good way for someone who is non-Chinese to pick the right, culturally appropriate name, so I highly recommend you hire local Chinese natives or a marketing agency to help on this. Remember this above all: China is all about app stores. Achieving a high rank across major third-party app stores (outside of the Apple App Store and Google Play Store) is key. Naturally, the higher the ranking, the more installs you can drive. Top positions in some of the major apps stores, which are sometimes housed within other mega-apps, can potentially drive millions or even tens of millions of users. 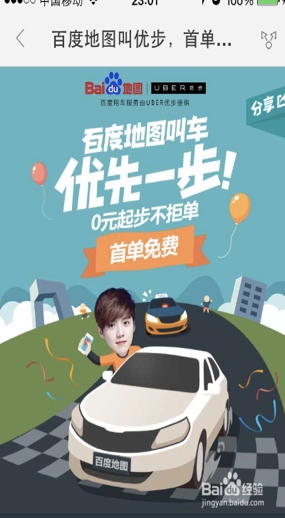 Uber on a third-party Chinese app store. To achieve optimal cost per install, you should constantly adjust your paid user acquisition strategies and combine with social media, community management, install exchanges and online and offline marketing campaigns that are heavily localized. Don’t forget: The more installs you get via paid channels, the more expensive it gets to sustain. The same U.S. concepts and theories for app store SEO applies for Chinese app stores. A/B test the Chinese titles, descriptions, keywords, tags and app category. China’s market is simultaneously sophisticated and totally old school. As such, many companies fail to realize the power of traditional, grassroots marketing in China. Street campaigns, handing out coupon codes and fliers in malls and even booth babes (one of the biggest marketing trends right now) remain highly effective. Small incentives, like 5 RMB given for downloading an app, work extremely well. Chinese consumers are not as cynical as Americans and Europeans about marketing, and still appreciate things like prizes and gifts. It’s also important for Western mobile companies to realize that PR does not work the same way in China. Press is not earned by pitching reporters, but is more often bought through gifts, dinners and events. It’s just the way things work there. Some experimentation with networks will be necessary. Different ad networks are better for different kinds of apps, and each will drive a specific kind of user. Only double down when you’ve found the right network that brings you the right kind of user. Sometimes these users can turn out to be fake -– but hopefully fake users will drive a bump in the app store rankings and will drive real users through greater visibility. Lastly, there is plenty of opportunity to get pre-installed on smartphones across the various layers of the supply chain: OEMs, distributors even retailers. It’s common practice in China to open product boxes from OEMs and install apps at each stage before it goes to the consumer. Obviously, the earlier in the supply chain, the broader the impact. Regardless of how you get pre-installed, you’ll be perceived as bloat-ware by the savvier Chinese consumer. In addition to driving installs via ad networks, you can also buy installs from mega apps like news apps (今日头条, or Toutiao), messaging apps (WeChat) or even dating apps (陌陌, or Momo). For example, Baidu Maps integrates with Uber. When you get directions from one place to another, Baidu Maps will suggest Uber as one of the transportation options. In a similar partnership vein, Lyft is now working with Didi Kuadi to offer rides for its users in China. Finding the right mega-app partner can be the difference between success and failure in the Chinese market. Many apps that have meaningful traction in China are guaranteed to be copied. Unfortunately, most companies don’t realize that this is a great thing! The world’s best apps all have local copycats. It should be a boost of confident that your app is working. Examples include WeChat originally cloning Kakao Talk or TalkBox, or Didi Kuadi, which has done a good job of scaling up and challenging Uber. Now, even scammers are popping up. All this just points to the fact that there is real money flowing across the product-market — and it’s actually a very positive sign. The good thing for smaller app copycats is that the right local partner can help make sure any copycat apps are removed from app stores. Make friends and find local allies to help you work directly with app-store editors. Just stay focused on your business and continue to execute by following China’s rules. I hope these five simple tips give you a head start. China is a multi-layered country, but if you get the basics right, you’re off to a strong start in the world’s largest mobile market. If you can make it in China, you can make it anywhere.